The patented SynGas CHP Module is characterized by its particularly high electrical energy recovery from the dried sewage sludge. 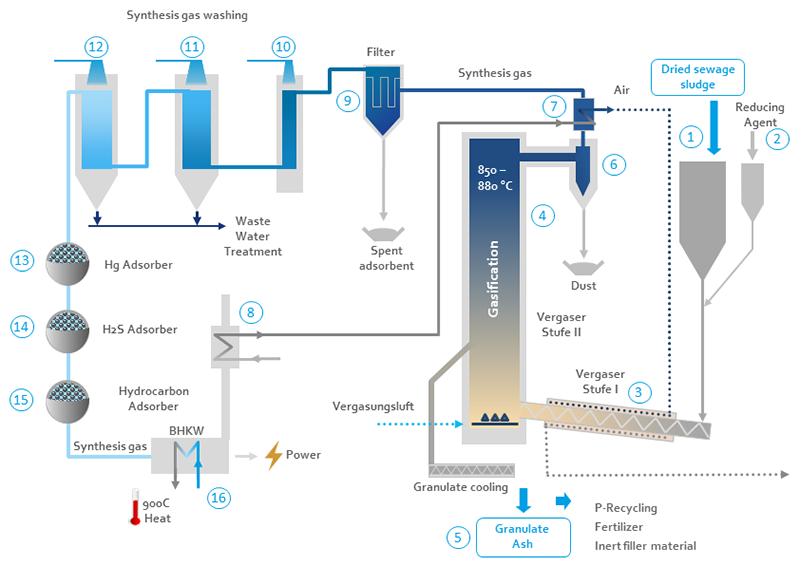 The synthesis gas produced in the gasification process is converted into electricity and heat in a high-efficiency combined heat and power plant (CHP) after a gas cleaning process. The surplus electricity can be fed to the wastewater treatment plant and the heat to the sludge drying process. Due to the high proportion of energy in the synthesis gas which is converted into electricity, the SynGas CHP Module is usually dependent on additional heat for drying the sewage sludge. In many cases, this heat can be covered by the waste heat from the digester gas CHPs. In combination with an anaerobic sludge digestion process it can lead to an energy self-sufficient wastewater treatment plant. From the silo, sewage sludge with a dry content of 85% – 95% (1) is transported together with limestone (2) to a thermolysis screw – stage I gasification (3). The products produced in thermolysis – thermolysis gas, carbon and ash – are conveyed into a fluidized bed gasifier – stage II gasification (4). In the second stage, the carbon is sub-stoichiometrically gasified and the long-chain molecules (so-called tars) of the thermolysis gas are cracked. The added limestone binds sulphur and is therefore the first desulphurization stage. The high gasification temperature of 850 °C completely destroys all toxic substances in the sewage sludge and removes heavy metals such as mercury or cadmium from the valuable sewage sludge ash. It ensures that the vital phosphorus in the ash granulate can be made directly available for use e.g. as fertilizer. The almost carbon-free ash granulate (5) is removed from the process via a sluice and collected. The synthesis gas produced in the fluidized bed gasifier is coarsely de-dusted in a cyclone (6) before the sensible heat of the synthesis gas is used in a heat exchanger (7) to preheat air. The preheated air provides a large part of the heat required in the thermolysis screw. The remaining amount of heat required is recovered from the flue gas heat from the CHP motor (8). The cooled synthesis gas is cleaned further in a fine filter (9). In a venturi scrubber (10) and a centrifugal scrubber (11) the gas is cooled to the saturation temperature of approx. 75 °C and residual dust and tar is separated. The scrubbers are operated in a loop with treated water from the wastewater treatment plant. In a downstream spray scrubber (12), the pollutant gas NH3 is separated out by dosing sulphuric acid and the gas is further cooled to approx. 40 °C. The spray scrubber is operated with a separate washing water loop. When a certain concentration of salts is reached, water is discharged via the first two stages for wastewater treatment. The treated wastewater is discharged into the wastewater treatment plant. Three activated carbon filters follow. The first (13) removes mercury with sulphur-impregnated activated carbon. In the second filter (14), special activated carbon is used for H2S separation. In the police filter (15) residual aromatic hydrocarbons are separated if concentrations are elevated due to irregularities in the process. The syngas is used in a combined heat and power plant (16) to generate electricity and process heat.